The Bereaved Fathers' Choir is a group of men who lost their children to terror or in IDFservice and who deal with the grief by singing. 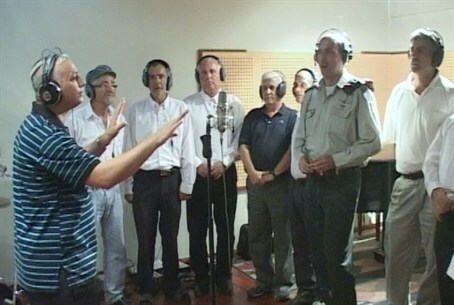 The Bereaved Father’s Choir is made up of a group of bereaved fathers whose children fell during their military service or were killed in terrorist attacks. The group members cope with bereavement by getting together and performing Israeli songs. They say that singing helps them to cope with the difficult loss. Arutz Sheva recently met up with this incredible group of individuals. Moshe Har Melekh lost his son, Shuli, eight years ago. One day after marking his son’s yahrzeit (anniversary of death), he joined his choir friends for their weekly meeting. Har Melekh said that despite the great losses the men feel, the songs they sing are not sad. One choir member, Cantor Moshe Keinan who lost his son Avihu, recently released a single put to the tune of Jewish Canadian singer Leonard Cohen’s song, “Hallelujah.” The words Keinan sang, however, were completely different and reflected his own personal loss.